I love a wander around the galleries and print shops of London and have already had a bit of a banter about how much I adore the sublime portraits of Reynolds, but he isn't my only favourite. 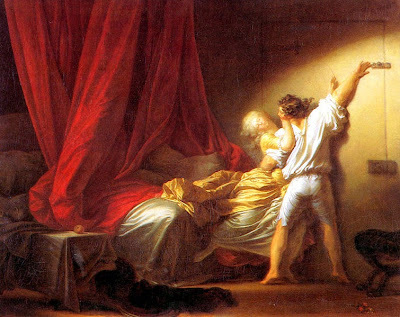 As a bit of a romantic, I've a very soft spot for the work of Jean-Honoré Fragonard and his colourful, intimate scenes. Fragonard was born to a glove maker who, due to a series of poor investments, found himself in something of a financial fix. 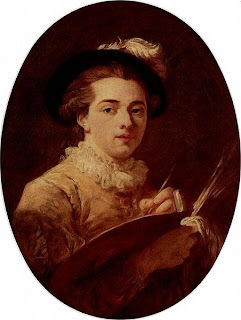 Dispatched to serve as apprentice to a notary in Paris, the young man's artistic talents become increasingly apparent until, at the age of 18, he was presented to François Boucher. Although impressed by Fragonard's skills, Boucher did not wish to tutor a relative novice no matter how enthusiastic and he sent Fragonard on to Jean-Baptiste-Siméon Chardin. Here Fragonard's artistic training began and within the year he was working in Boucher's studio, following this with a stint training under Charles-André van Loo. At the age of 20 Fragonard won the prestigious Prix de Rome and entered the École Royale des Elèves Protégés , specialising in history paintings. In 1756 he travelled to Rome and took up a place at the French Academy, where he would remain for five years. Continuing the skills he had learned with Boucher, he copied the works of the artists he admired, perfecting his skills and executing a number of prestigious commissions. In Rome he became close friends with Hubert Robert and the two toured Italy extensively, honing their craft and taking in sights and experiences that would forever influence Fragonard's work. His reputation was cemented when, in 1765, he was admitted to the Royal Academy. Celebrated by Diderot and patronised by the most illustrious citizens of Paris, Fragonard became a particular favourite at the court of Louis XV. 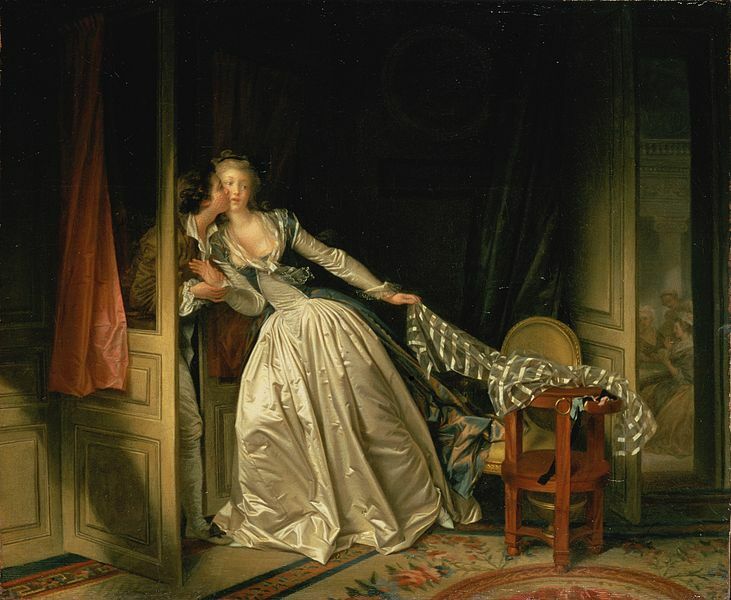 History painting set aside for now, his works decorated the private apartments of the King's favourites and the intrigues he witnessed at Versailles inspired the artist to produce scenes of eroticism and beauty. His works are light and colourful; they celebrate the rococo and a simple, pastoral romanticism. 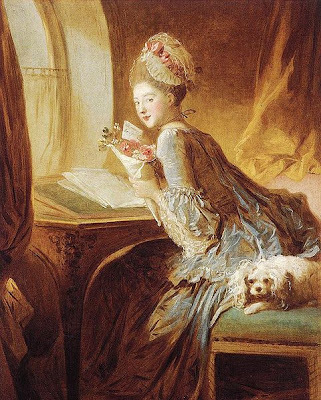 Fragonard counted Madame du Barry among his admirers, the King's mistress commissioning a number of works, The Progress of Love, for her home at Louveciennes. However, his patroness disliked the finished series and rejected them, leaving Fragonard dejected and disillusioned. The artist put the disappointment of Madame du Barry's rejection behind him by undertaking a tour of Europe in the company of his wife and fellow painter, Marie-Anne Gérard, and their equally artistic children. During this period he produced a number of drawings and sketches before returning to his homeland in time to witness many of his greatest patrons go to the guillotine as the Reign of Terror swept Paris. As he grew older Fragonard worked at the Louvre and taught young up and coming artists even as his own star declined, the painter who had decorated the apartments of Versailles forgotten for decades. His reputation has revived in more recent times and once again we can revel in his hedonistic, fabulous rococo world, reliving just a little of the Ancien Régime; salut, Jean-Honoré Fragonard! As well as a few Fragonards in my Gin Lane abode, I've put together a little collection on Pinterest too, do come and have a browse! You don't disappoint, Madame Gilflurt! I read all the way with baited breath and yes, there was the guillotine right at the very end! I love that painting, The Bolt! Truly magical energy. As always, your descriptions evoke a feel of the times and some of the heady (and risky) times at Versailles! I love his work! The Swing- fabulous. Thank you! We have had a lot of guillotines lately, it's true - tomorrow it's going to be even worse! Lovely entry. These paintings are gorgeous... ♥ I most particularly like The Stolen Kiss. The light and setting in there are just perfect. PS: I also loved your Pinterest board :-). Thank you so much! 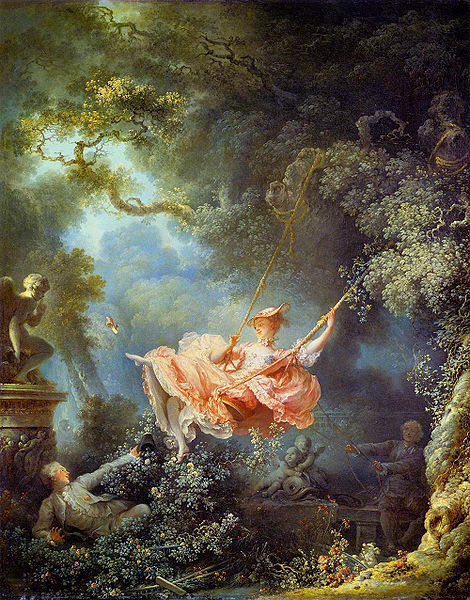 Fragonard is a favourite of mine, his pictures tell so many wonderful stories. My pleasure; I can lose hours on there! I always look forward to reading your posts and enjoyed reading the history of this particular artist. I already had a couple of his paintings on my Pinterest board but thank you for adding to it. I tend to get lost on Pinterest, too, if I'm not careful. Thank you, Sherry, that means a lot to me. I hope you find lots and lots to enjoy on the Pinterest boards! These are marvelous paintings. I love The Bolt. I cries out for a caption. The background is fascinating. I too love Pinterest. It is midnight so I won't explore right now but I intend to. Oh, midnight and Pinterest are not a happy combination - I wouldn't sleep all night!